Munich - Matchday 3 served up its fair share of drama, including a handful of audacious strikes from some of the Bundesliga's finest. 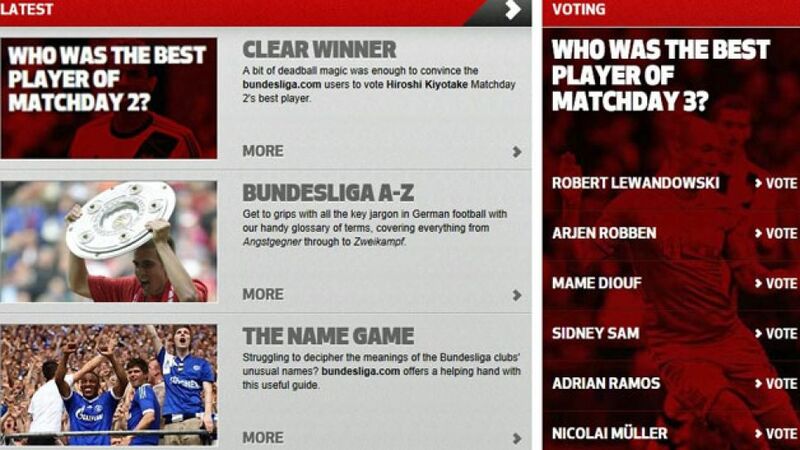 Of those, it was Arjen Robben's delectable solo effort that sent the replay button into overdrive, with the bundesliga.com readers accordingly voting the FC Bayern Munich flier their standout player of the weekend. The winger raced over the finish line in more ways then one, beating three defenders and slotting past Raphael Schäfer in Bayern's 2-0 derby victory over 1. FC Nürnberg, before collecting 48 per cent of our weekly poll for good measure. Joining Robben on the podium is Robert Lewandowski, who helped himself to his second Bundesliga goal of the new campaign in Borussia Dortmund's hard-fought 1-0 success over Werder Bremen. The Poland international's trademark strike garnered 26 per cent of the vote. Bayer 04 Leverkusen's hero of the hour Sidney Sam sneaks in at third (13 per cent), after scoring twice and chipping with an assist in the Rhine derby win over Borussia Mönchengladbach. The 25-year-old is enjoying a new lease of life this season and it certainly shows, with some whirlwind displays even managing to catch the eye of Germany head coach Joachim Löw. That brings us neatly onto the nearly rans. Nicolai Müller's emphatic breakaway goal against VfL Wolfsburg was deemed worthy of only seven per cent of the vote, with Hannover 96 striker Mame Diouf (four per cent) and Hertha Berlin match-winner Adrian Ramos (two per cent) bringing up the rear.